Nineteen Holocene eruptive centers (cinder cones with lava flows and maars) were located and described in the Avacha horst and anticline zone west of the East Kamchatka volcanic area. A tephrochronological study and the carbon-14 dating of soil and plant remains ranked the eruptive centers into three age groups: 11 000-7700, 3000-2500, and 1200-600 carbon-14 years B. P. The eruptive centers of these groups are believed to have been operating roughly synchronously with the periods of active magma injection in the East Kamchatka volcanic area. Eruptive histories were reconstructed for some of the volcanic centers. The structural and tectonic settings, geographical positions, and elevations of the centers were analyzed. The volume (1.1 km3) and weight (1.8 X 10^9 metric tons) of the erupted rocks were evaluated. The productivity of the plateau basalt volcanism was found to be 10-100 times lower than the plateau basalt productivity in the area of grabens and synclines, possibly, because of the more shallow basement in the horsts and because of the fact that the compression of the crust under uplifting conditions hampered the magma rise toward the surface. Most of the lavas and pyroclastics are basalts of the medium-potassic series, some having medium (54-62) and some elevated (65-70) Kmg values. Der Geologe Karl von Ditmar erkundete von 1851 bis 1855 im Auftrag der russischen Regierung die Bodenschätze Kamčatkas. Dabei erforschte er das Land und seine Bevölkerung aber weit über diesen Autrag hinaus, was seine eindrucksvollen Reisebeschreibungen zeigen. So verbrachte er im Sommer 1853 als erster Forscher längere Zeit bei den Korjaken auf der Halbinsel Tajgonos. Der 1890 erschienene erste Teil seines Werkes enthält den ausführlichen Bericht seiner Reise nach den Tagebüchern, ein getrennt erscheinender zweiter Teil die systematische Darstellung der Natur und der Geschichte Kamčatkas. Der Geologe Karl von Ditmar erkundete von 1851 bis 1855 im Auftrag der russischen Regierung die Bodenschätze Kamčatkas. Dabei erforschte er das Land und seine Bevölkerung aber weit über diesen Autrag hinaus, was seine eindrucksvollen Reisebeschreibungen zeigen. So verbrachte er im Sommer 1853 als erster Forscher längere Zeit bei den Korjaken auf der Halbinsel Tajgonos. Der 1900 erschienene zweite Teil seines Werkes enthält die systematische Darstellung der Natur und der Geschichte Kamčatkas sowie ein geografisches Lexikon. Limit equilibrium analyses were applied to the 1980 Mount St. Helens and 1956 Bezymianny failures in order to examine the influence on stability of structural deformation produced by cryptodome emplacement. Weakening structures associated with the cryptodome include outward-dipping normal faults bounding a summit graben and a flat shear zone at the base of the bulged flank generated by lateral push of the magma. Together with the head of the magmatic body itself, these structures serve directly to localize failure along a critical surface with low stability deep within the interior of the edifice. This critical surface, with the safety coefficient reduced by 25–30%, is then very sensitive to stability condition variation, in particular to the pore-pressure ratio (ru) and seismicity coefficient (n). For ru=0.3, or n=0.2, the deep surface suffers catastrophic failure, removing a large volume of the edifice flank. In the case of Mount St. Helens, failure occurred within a material with angle of friction ~40°, cohesion in the range 105–106 Pa, and probably significant water pore pressure. On 18 May 1980, detachment of slide block I occurred along a newly formed rupture surface passing through the crest of the bulge. Although sliding of block I may have been helped by the basal shear zone, significant pore pressure and a triggering earthquake were required (ru=0.3 and n=0.2). Detachment of the second block was guided by the summit normal fault, the front of the cryptodome, and the basal shear zone. This occurred along a deep critical surface, which was on the verge of failure even before the 18 May 1980 earthquake. The stability of equivalent surfaces at Bezymianny Volcano appears significantly higher. Thus, although magma had already reached the surface, weaker materials, or higher pore pressure and/or seismic conditions were probably required to reach the rupture threshold. From our analysis, we find that deep-seated sector collapses formed by removing the edifice summit cannot generally result from a single slide. Cryptodome-induced deformation does, however, provide a deep potential slip surface. As previously thought, it may assist deep-seated sector collapse because it favors multiple retrogressive slides. This leads to explosive depressurization of the magmatic and hydrothermal systems, which undermines the edifice summit and produces secondary collapses and explosive blasts. The different roles of variable mantle sources and intra-crustal differentiation processes at Bakening volcano (Kamchatka) and contemporaneous basaltic monogenetic centers are studied using major and trace elements and isotopic data. Three suites of volcanic activity are recognized: (1) plateau basalts of Lower Pleistocene age; (2) andesites and dacites of the Bakening volcano, the New Bakening volcano dacitic centers nearby; and (3) contemporaneous basaltic cinder cones erupted along subduction zone—parallel N–S faults. Age-data show that the last eruptions in the Bakening area occurred only 600–1200 years ago, suggesting the volcano is potentially active. Major element variations and petrographic observations provides evidence for a fractionation assemblage of olivine, clinopyroxene, ±plagioclase, ±magnetite (?) within the basaltic suite. The fractionation in the andesites and dacites is dominated by amphibole, clinopyroxene, orthopyroxene and plagioclase plus minor amounts of magnetite and apatite. The youngest cpx-opx-andesites of Bakening main volcano deviate from that trend. Their source was probably formed by mixing of basaltic magmas into the silicic magma chamber of the Bakening volcano. Overall trace element patterns as well as the Sr–Nd–Pb isotopic compositions are quite similar in all rocks despite large differences in their chemical composition (from basalt to rhyodacite). In detail however, the andesite–dacites of the central Bakening volcano show a stronger enrichment in the more incompatible elements and depletion in HREE compared to the monogenetic basaltic centers. This results in a crossing of the REE-pattern for the two suites. The decrease in the HREEs can be explained by amphibole fractionation. A slab component is less likely because it would result in fractionation of the HREE from each other, which is not observed. The higher relative amounts of LILE in the dacitic and the large scatter in the basaltic rocks must be the result of a variable source enrichment by slab-derived fluids overprinting a variable depleted mantle wedge. The plateau basalts are less depleted in HFSE and show a more fractionated HREE pattern. These lavas could either result from a slab component or the addition of an OIB-type enriched mantle in their source. 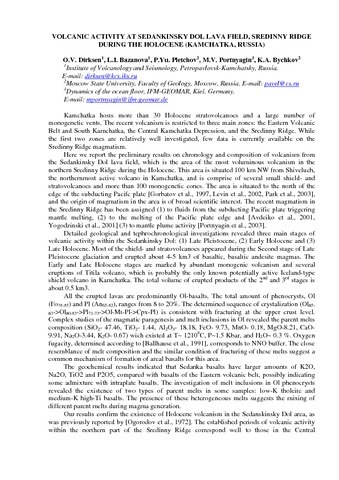 Oxygen isotope ratios of olivine and clinopyroxene phenocrysts from the Kluchevskoy volcano in Kamchatka have been studied by CO2 and ArF laser techniques. Measured δ18O values of 5.8–7.1‰ for olivine and 6.2–7.5‰ for clinopyroxene are significantly heavier than typical mantle values and cannot be explained by crustal assimilation or a contribution of oceanic sediments. Positive correlations between δ18O and fluid-mobile elements (Cs, Li, Sr, Rb, Ba, Th, U, LREE, K) and a lack of correlation with fluid-immobile elements (HFSE, HREE) suggest that 18O was introduced into the mantle source by a fluid from subducted altered oceanic basalt. This conclusion is supported by radiogenic isotopes (Sr, Nd, Pb). Mass balance excludes simple fluid-induced mantle melting. Instead, our observations are consistent with melting a mantle wedge which has been hydrated by 18O-rich fluids percolating through the mantle wedge. 18O-enriched fluids are derived from the subducted oceanic crust and the Emperor seamount chain, which is responsible for a particularly high fluid flux. This hydrated mantle wedge was subsequently involved in arc magmatism beneath Kluchevskoy by active intra-arc rifting. 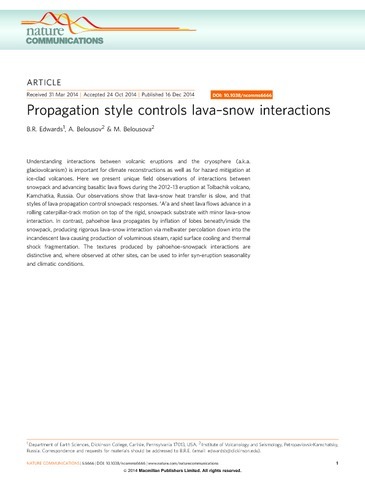 Edwards B. , Belousov A., Belousova M. Propagation style controls lava-snow interactions // Nature Communications. 2014. V. 5. 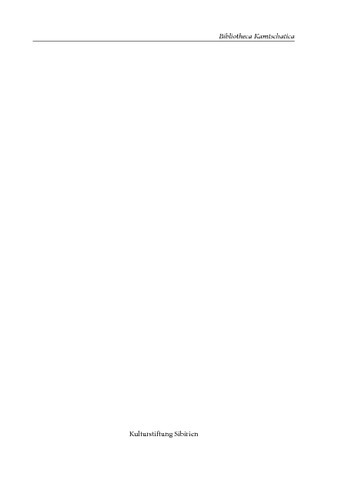 № 56666. P. 1-5. doi: 10.1038/ncomms6666. On 27 November 2012 at 1715 local time, a focused swarm of earthquakes was interpreted as the start of a new ongoing eruption on the south flank (Tolbachinsky Dol) of Plosky Tolbachik volcano in east central Kamchatka, Russia (Figure 1a) [Samoylenko et al., 2012]. Visual observations on 29 November showed ash shooting from two fractures as well as long, rapidly moving lava flows. Although the initial ash clouds reached 6 kilometers in height, subsequent ashfall has been limited to the area around the main vents, and no permanent settlements are in danger from advancing lava flows (the closest settlements are about 40 kilometers from the volcano). Including this eruption, six different volcanoes are presently active in Kamchatka. 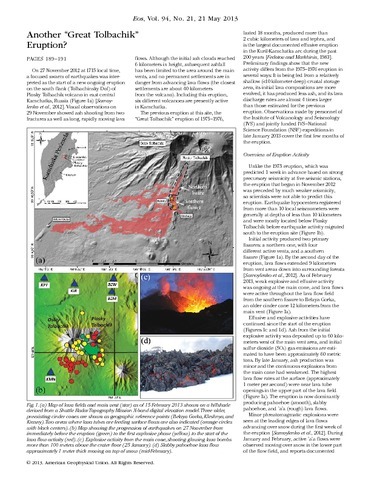 Abstract Observations made during January and April 2013 show that interactions between lava flows and snowpack during the 2012–13 Tolbachik fissure eruption in Kamchatka, Russia, were controlled by different styles of emplacement and flow velocities. `A`a lava flows and sheet lava flows generally moved on top of the snowpack with few immediate signs of interaction besides localized steaming. However, lavas melted through underlying snowpack 1–4 m thick within 12 to 24 h, and melt water flowed episodically from the beneath flows. Pahoehoe lava lobes had lower velocities and locally moved beneath/within the snowpack; even there the snow melting was limited. Snowpack responses were physical, including compressional buckling and doming, and thermal, including partial and complete melting. Maximum lava temperatures were up to 1355 K (1082 °C; type K thermal probes), and maximum measured meltwater temperatures were 335 K (62.7 °C). Theoretical estimates for rates of rapid (e.g., radiative) and slower (conductive) snowmelt are consistent with field observations showing that lava advance was fast enough for `a`a and sheet flows to move on top of the snowpack. At least two styles of physical interactions between lava flows and snowpack observed at Tolbachik have not been previously reported: migration of lava flows beneath the snowpack, and localized phreatomagmatic explosions caused by snowpack failure beneath lava. The distinctive morphologies of sub-snowpack lava flows have a high preservation potential and can be used to document snowpack emplacement during eruptions.